The launch of SpaceX’s next resupply run to the International Space Station has been rescheduled for April 13, officials said Tuesday. The Falcon 9 rocket’s liftoff from Cape Canaveral was due for no earlier than April 10, but the launch date has been delayed to April 13. Officials did not provide a reason for the delay. Blastoff from Cape Canaveral’s Complex 40 launch pad is set for 4:33 p.m. EDT (2033 GMT). The 20-story rocket will have one second to lift off when the space station’s orbital path passes over Florida’s Space Coast. 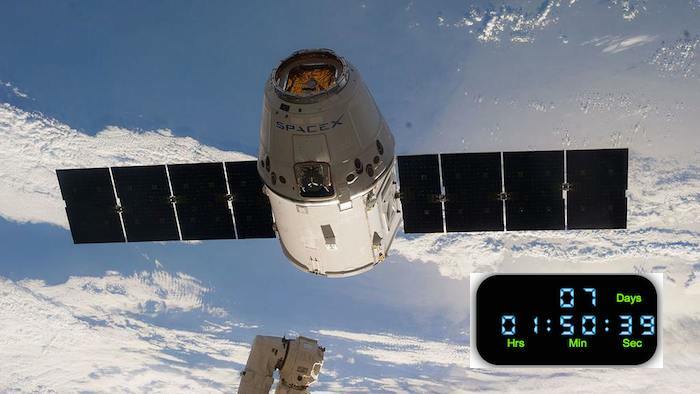 The mission will send SpaceX’s Dragon supply ship into orbit in pursuit of the space station. The Dragon capsule will carry several tons of provisions and experiments to the complex, where the lab’s Canadian-built robot arm will grapple the SpaceX-owned spaceship after a laser-guided final approach. The Dragon spacecraft will stay at the space station about one month, then return to Earth in May with a parachute-assisted splashdown in the Pacific Ocean, returning research specimens and other equipment to scientists and engineers on the ground. The April 13 flight will be SpaceX’s fourth Falcon 9 launch of the year, and the company’s sixth operational logistics mission to the space station. SpaceX won a $1.6 billion contract in 2008 for 12 resupply flights to the outpost. NASA recently awarded a contract extension to SpaceX, giving the company 15 flights through 2017. SpaceX shuffled the order of its upcoming launches earlier this month to inspect rockets at Cape Canaveral for leaky helium pressurization systems after discovering a problem in the Falcon 9 factory in Southern California. The launch of a European-built communications satellite for the government of Turkmenistan was supposed to take off March 21, but SpaceX opted to delay the mission to around April 24, allowing the space station resupply flight to launch next in the queue. The launch for Turkmenistan — with a satellite named TurkmenAlem52E/MonacoSat — is apparently still on track for late April. SpaceX’s cramped manifest continues in May with a planned test of an abort system for a human-rated version of the Dragon spacecraft expected to loft astronauts into orbit by the end of 2017. Showers and thick clouds might pose a challenge Monday afternoon during SpaceX's attempt to launch its next International Space Station resupply mission from Cape Canaveral Air Force Station. There's a 60 percent chance of favorable weather for the instantaneous launch window at 4:33 p.m. Monday, according to the Air Force's 45th Weather Squadron. A cold front moving through the area is expected to cause thunderstorms and lightning over the weekend. It should begin to dissipate Monday, but there remains "a threat of rain showers, thick cloud coverage and anvils drifting towards the coast from inland storms," the forecast reads. SpaceX will try to launch a 208-foot Falcon 9 rocket and Dragon spacecraft packed with more than 4,300 pounds of food, equipment and experiments. The mission is SpaceX's sixth under a NASA Commercial Resupply Services contract originally valued at $1.6 billion for 12 flights, but which has had several missions added. A Monday launch would put the Dragon on course to reach the station early Wednesday. If the launch slips to Tuesday, there is a 70 percent chance of favorable weather. After the launch, SpaceX will make another attempt to land its Falcon 9 booster on an ocean-going platform it calls the "autonomous spaceport drone ship," part of tests aimed at developing a reusable rocket. SpaceX plans an important pre-launch test-firing of the booster's nine Merlin engines on Saturday at Launch Complex 40. Kennedy Space Center will host a series of news briefings about the mission on Sunday afternoon, including a launch status update at 5 p.m. You can watch them on NASA TV. 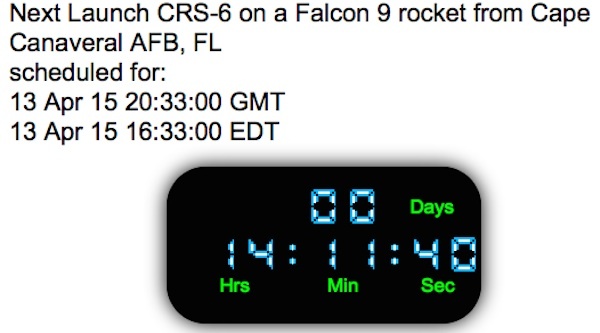 Visit floridatoday.com on Monday for countdown updates, chat and NASA TV coverage starting at 3:30 p.m.
SpaceX will try again to make history during the launch of its robotic Dragon cargo capsule to the International Space Station on Monday (April 13). The company aims to bring the first stage of its Falcon 9 rocket back to Earth for a soft touchdown on an unmanned "spaceport drone ship" in the Atlantic Ocean after the booster sends Dragon on its way toward the orbiting lab. Liftoff is scheduled for 4:33 p.m. EDT (2033 GMT) Monday from Florida's Cape Canaveral Air Force Station; you can watch all the action live here at Space.com, courtesy of NASA TV. SpaceX attempted the same reusable-rocket maneuver during the last Dragon cargo launch, which occurred in January, and very nearly pulled it off: The Falcon 9 first stage succeeded in hitting the drone ship but came in a bit too hard and exploded on the deck. Graphic showing how SpaceX's bold reusable-rocket test — currently scheduled to take place during the launch of the company's Dragon cargo capsule toward the International Space Station on April 13, 2015 — will work. The rocket stage's stabilizing "hypersonic grid fins" ran out of hydraulic fluid, SpaceX founder and CEO Elon Musk said after the Jan. 10 try. He vowed to fix that particular issue in time for the next attempt. 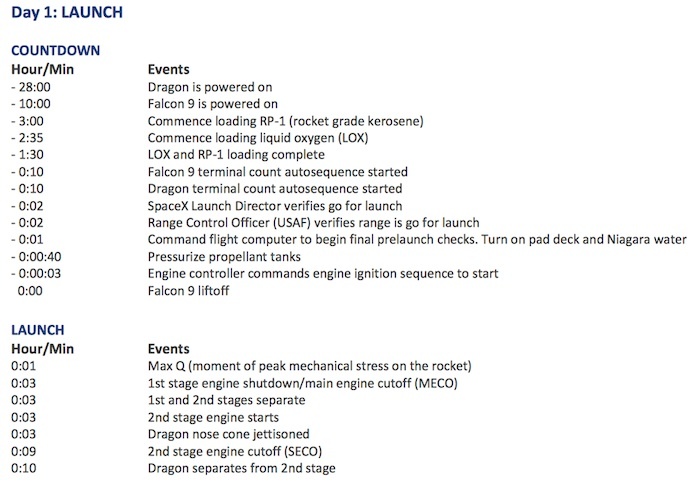 The next booster to come down for a drone-ship landing will have "way more hydraulic fluid," Musk tweeted on Jan. 16. "At least it shd explode for a diff reason." The autonomous drone ship, incidentally, is named "Just Read the Instructions," after a sentient colony vessel from the sci-fi novels of Iain M. Banks. 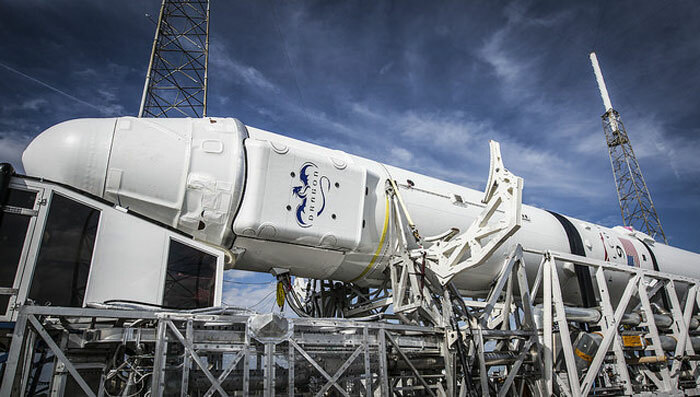 Monday's test is part of SpaceX's effort to develop fully and rapidly reusable rockets. Such technology could slash the cost of spaceflight by a factor of 100, helping open the heavens to exploration, Musk has said. The main mission on Monday, however, is to get Dragon and the 4,387 lbs. (2,015 kilograms) of food, supplies and scientific experiments that it's toting on course to the space station. The launch will initiate the sixth of 12 cargo missions that SpaceX is flying to the orbiting lab under a $1.6 billion NASA contract. 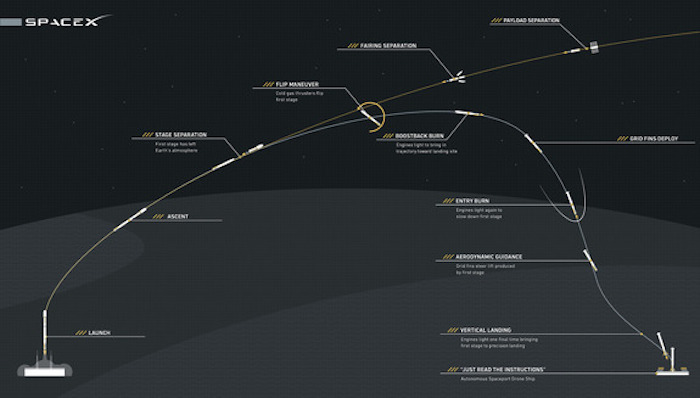 If all goes according to plan, Dragon will arrive at the station on Wednesday (April 15). The spacecraft will spend about five weeks attached to the $100 billion complex before coming back down to Earth with 3,020 lbs. (1,370 kg) of science gear, hardware and trash. 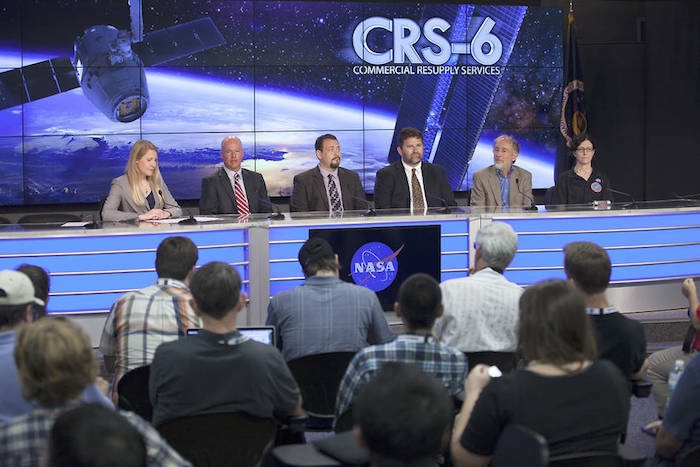 April 12, 2015 - In the Kennedy Space Center’s Press Site auditorium, agency leaders speak to members of the media on Science, Research and Technology work in progress aboard the International Space Station. NASA is preparing for the launch of SpaceX CRS-6, the sixth commercial resupply services mission to the International Space Station. From left are: Stephanie Schierholz of NASA’s Office of Communications, Marshall Porterfield, director of Space Life and Physical Sciences at NASA Headquarters, Kirt Costello, International Space Station deputy chief scientist at NASA’s Johnson Space Center, Mike Roberts, senior research pathway manager for the Center for the Advancement of Science in Space, Noel Clark of the University of Colorado who is the principal investigator for the Observation and Analysis of Smectic Islands In Space (OASIS), and Paola D. Pajevic of Harvard University who is principal investigator Osteocytes and Mechanomechano-transduction (Osteo-4). Next Launch Opportunity: Tuesday, 4:10 p.m.
Because of weather conditions that violated the rules for launching, SpaceX has postponed its planned launch of its Falcon 9 rocket carrying the Dragon spacecraft. 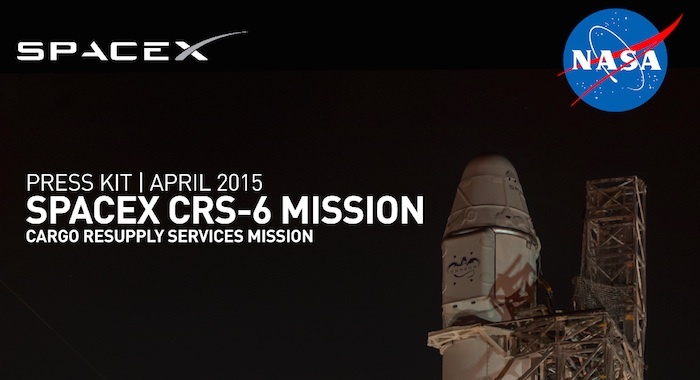 It is SpaceX’s sixth commercial resupply services mission to the International Space Station. The next launch opportunity is Tuesday, April 14, at 4:10:40 p.m. EDT. Our continuous launch coverage will begin at 3 p.m. here on the launch blog and on NASA Television at http://www.nasa.gov/nasatv. As for tomorrow’s forecast, it’s slightly worse tomorrow with forecasters predicting a 50 percent chance of acceptable conditions. Hazardous anvil clouds approaching from a nearby thunderstorm forced SpaceX to abort the takeoff of a Falcon 9 launcher Monday, delaying the start of an International Space Station resupply mission and a bold attempt to recover the rocket intact on an ocean-going platform. The liftoff was set for 4:33 p.m. EDT (2033 GMT), but developing thunderstorms southwest of the launch base caught the attention of meteorologists in the final minutes of the countdown. Anvil clouds attached to a thunderstorm encroached within a 10-mile exclusion zone around the Falcon 9 launch pad, and the U.S. Air Force weather officer ordered a hold at the countdown’s three-minute mark. The rocket only had one second to blast off and fly on course toward the space station, so the hold automatically triggered a launch delay. The launch team came “just about as close as we could get,” said Mike Curie, NASA TV commentator for the flight. The SpaceX launch team planned to drain the Falcon 9 rocket of propellant and configure the 208-foot-tall launcher for another try. The launch time on Tuesday is scheduled for 4:10:40 p.m. EDT (2010 GMT), and forecasters predict a 50 percent chance weather conditions will exceed one of the launch rules. That forecast is slightly worse than the outlook going into Monday’s launch attempt. Officials will be on the lookout for cumulus clouds and anvil clouds Tuesday, along with the threat of lightning in the area. The forecast calls for overcast skies, southerly winds and a temperature of about 80 degrees Fahrenheit at launch time Tuesday. The Falcon 9 rocket is awaiting its 17th flight and fourth launch of the year. SpaceX’s commercial Dragon cargo craft will deploy from the Falcon 9 rocket’s second stage about 10 minutes after liftoff, beginning a two-day trek to the space station. 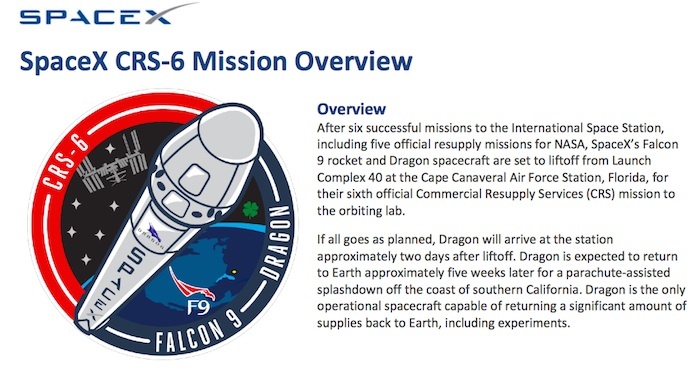 After a series of maneuvers to adjust its orbit to match the path of the 450-ton research outpost, the Dragon will use a laser navigation system to rendezvous with the station Thursday, assuming the launch occurs Tuesday. Astronaut Samantha Cristoforetti will take control of the space station’s Canadian-built robotic arm to grab the Dragon capsule around 7 a.m. EDT (1100 GMT) Thursday as it hovers just beneath the complex. Nearly 4,400 pounds of food, experiments and spare parts are stowed inside the Dragon’s pressurized cabin. The capsule’s external trunk section — sometimes used to carry up unpressurized experiment packages — is empty on this mission. SpaceX has a contract with NASA for 15 resupply missions to the space station, and the upcoming flight is the sixth launch in the series. The supply ship will stay attached to the space station until late May, when it will detach and fly back through the atmosphere for a parachute-assisted splashdown in the Pacific Ocean, bringing back about 1.5 tons of research specimens and other equipment tagged for return to Earth. SpaceX plans to use the launch for a secondary objective to recover the Falcon 9’s first stage booster with a vertical rocket-powered landing on a specially-outfitted barge in the Atlantic Ocean. The landing platform is called an autonomous spaceport drone ship by SpaceX, and a successful touchdown would move the company closer to its goal of fielding a partially reusable rocket, an achievement officials say would reduce the cost of future launchings. 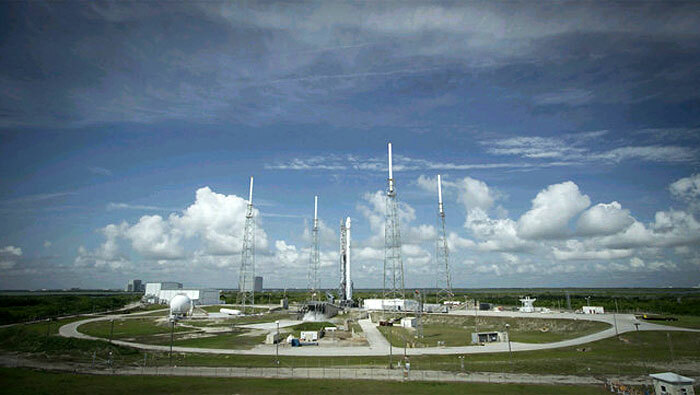 Weather is 60% "go" for today’s Falcon 9 launch attempt, sending Dragon to resupply the International Space Station. Lightning and clouds are still a concern. Liftoff is targeted for 4:10pm ET – live launch webcast begins at 3:55pm.